I have never really watched Cartoon Network, mainly because the only show on there that comes to mind is Space Ghost, which flat out annoyed me as a kid. Plus, there never ever seems to be anything good on there (here comes the hate mail). Anyway, it turns out I will finally have a good reason to watch it next Monday, February 20th. On something called the Hall of Game Awards, our beloved Cam Newton is up for an award called “Gnarliest Newb.” For you old cats, that basically means best newcomer. You see, “gnarly” means “cool” or “hip,” and “newb” is short for “newbie,” which is obviously a slang term to describe an FNG. If you don’t know what FNG means, then ask somebody, but I didn’t say it. Anyway, Cam is up against Trevor Bayne, some NASCAR guy, Jeff Skinner, some hockey guy, and Craig Kimbrel, who is an Atlanta Brave, but is also a noted Alabama fan. The choice is clear. Vote for Cam. You can do so here on the most annoying website I have ever visited. 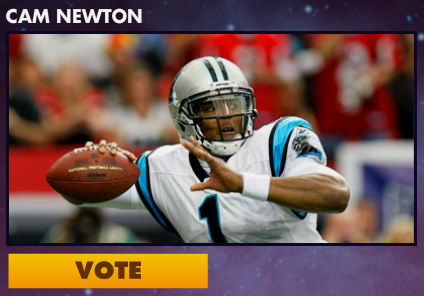 Seriously, click ‘Vote’ by Cam’s name (luckily he is the first one that comes up) and then get out, or you will feel like throwing your computer across the room. No joke, I was on it for two minutes and my eyes and ears started bleeding. THE NOISE!!!! If you’d like to bypass the horror I’ve just described, you can visit hallofgame.com on your mobile device. Either way, just vote.